The Duchess, a new biography of the Duchess of Cornwall, by Penny Junor will be published by William Collins in the UK on June 29. The book will not be published in the US until early 2018. The biography is published in connection with the Duchess of Cornwall's 70th birthday. In 1983, I started RBN Royal Book News, a bi-monthly newsletter, where I reviewed English and non-English books on royalty. I published the newsletter until about a decade ago, due to the rising international postage. This blog is the newsletter's successor - where I can reach even more readers without having to raise postage. In the last 34 years, I have written numerous times about the dearth of non-British royal books published in English. There are several reasons for this. The first reason is no market. Let me repeat this, as sad as it sounds to those of us who are interested in royalty, the Anglo-market is largely non-existent. Anglo-American publishers are not going to invest money in a book about Crown Princess Victoria of Sweden or King Felipe V of Spain because the books won't make money. Sad. But true. The second reason is translation costs. Yes, there are books in Denmark, Norway, Sweden, Luxembourg (lovely books published in Luxembourg), Spain, Liechtenstein (okay, few books available on the princely family), Monaco (many books in English on Princess Grace and her family), the Netherlands (Wilhelmina's memoirs were translated into English), as well as the non-European monarchies. Translations are expensive. Publishers hire professional translators, and the cost for these services are expensive. A good translator is well worth the price. The cost for the translation is built into the cost of publishing the book. A publisher has to recoup the publishing costs. This means the book has to make money. Royal books rarely make the best sellers list. The text for the annual Swedish royal year book, Det Kungliga aret, is in Swedish and English. A scholarly biography is more likely to be translated in English. John Rohl's massive three-volumed biography of Kaiser Wilhelm II was translated into English by Cambridge University Press. However, this is a seminal and masterful achievement, and not a book about what Crown Princess Mary of Denmark wears. A third reason is source material. If you are writing an authoritative, well-researched book on the Spanish royal family, you need to speak Spanish and be able to access those sources. John van der Kiste writes competent and interesting books on non-British royals, but admits he is hampered in his research because he is limited to English-language sources. The publisher of the Dutch royalty magazine, Vorsten, made an attempt to break into the Anglo market with The Crown, a quarterly journal that included Vorsten articles translated into English. Unfortunately, the magazine ceased publication after two issues. Money is the fourth reason. Most published authors do not make a lot of money. Bestsellers of course make money for authors and publishers. Authors need literary agents who negotiate a decent contract with a publisher - who then sells foreign rights, which means more money for a writer. A writer who does not have an agent will make less money. However, literary agents charge fees, which are paid by the author out of the author's advance and royalties. A good publisher might give the writer an advance on royalties. A writer won't get further payments from the publisher if the publisher does not make money on the book. Royalties are paid only after the publishing company has earned back the money paid to the writer. Only after this will royalties be paid. From The Business of Publishing: "Typically, an author can expect to receive the following royalties: Hardback edition: 10% of the retail price on the first 5,000 copies; 12.5% for the next 5,000 copies sold, then 15% for all further copies sold. Paperback: 8% of retail price on the first 150,000 copies sold, then 10% thereafter." This statement usually applies to the larger houses. A smaller house will probably pay less. A book on Crown Princess Victoria in English is unlikely to sell 5000 copies, which means a publisher is unlikely to sign a contract to publish the book. Why? No profit. Of course, a writer could go the vanity press (self-publishing) route. Numerous caveats here. No one checks a manuscript for veracity. The owners of vanity presses will pay authors even less than the legitimate publishing house. The number of English-language British royal books being published has gone down in the past several years. Books about William and Catherine do not sell .. and we do not need more books on the Duke and Duchess of Cambridge. Far fewer scholarly royal biographies are being published, certainly on post Georgian royals. The Tudors remain popular, both for biographies and historical fiction. I would love to see a new biography on Queen Alexandra, the consort of Edward VII. The most recent biography was written by Georgina Battiscombe and published in 1969. There is unlikely to be another. Why? Queen Alexandra did not leave a paper trail. She destroyed her correspondence and other papers. And the final reason: living royals are works in progress so difficult to write competent and authoritative books about them, It is easy to write books that do not have footnotes and a lot of photographs, but these books are largely fluff and cannot be taken seriously. I have been reviewing and writing about royal books for more than 35 years -- and I am a published author and I write about royal for several magazines -- so I feel competent to make these comments. It also should be noted that most books on the British royals, past and present, have not been translated in other languages. In conclusion, a royal watcher might say that I would love to read a book in English about Crown Princess Mette Marit Publishers need thousands of these readers. I love reading and writing about royalty, and I admit my standards are high. I do not care who designed the Duchess of Cambridge's shoes or that Crown Princess Victoria wore the same jacket to three different events. That is not royal writing. In conclusion, don't expect to see British or American publishers seeking out writers to produce books on living non-British royals. book of photographs of the Romanov Family? Well, the answer is yes, you need to have The Romanovs, which is the second volume in Eurohistory.com's Royal Collection Series. So what to we have here? For starters, the book has nearly 300 pages of photographs from Art Beeche's Eurohistory archives, In the past few decades, Art has acquired an impressive array of royal photos through auctions, acquisition and gifts. One of the more important collections that Art has acquired came from the late Grand Duchess Helen of Russia, who married Prince Nicholas of Greece. The book is separated into 10 chapters: the Romanov Dynasty, Alexander II, Alexander III (& three of his younger children: George. Michael and Alexandra), Nicholas II, the Senior Grand Dukes Vladimir, Alexei, Sergei. and Paul and their families; Grand Duke Konstantin Nikolaievich and the Konstantinovichi Grand Dukes; Grand Duke Nicholas Nikolaievich and his descendants; Grand Duke Michael Nikolaievich and his descendants; Grand Duchess Maria Nikolaievna and the dukes of Leuchtenberg, and Grand Duke Michael Pavlovich and his descendants. Yes, the entire Romanov clan - from formal group shots and formal portraits to family snaps, such as a rare image of Nicholas II wearing mufti. Many of the more informal photos come from Grand Duchess Helen's albums. Family dynamics aside, Grand Duchess Helen tried to maintain a cordial relationship with Nicholas and Alexandra. This was difficult as Helen's brother, Kirill, was married to Princess Victoria Melita of Edinburgh, whose first husband, Grand Duke Ernst Ludwig of Hesse and By Rhine, was Alexandra's older brother. A precarious situation as Ducky had been Alix's sister-in-law, but was also her first cousin. 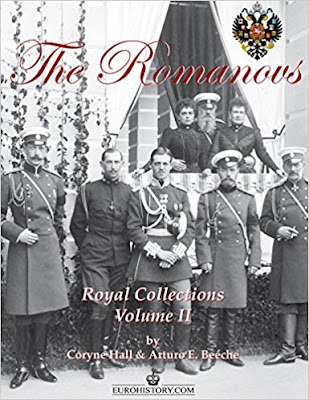 Most photo books focus solely on Nicholas and Alexandra, with the familiar and oft-used photos.This book offers a photograph record of every branch of the Romanov dynasty from 1845 until 1917 -- the end of the Romanov dynasty. This book includes many unpublished photos. A real treat. One of my favorite photos is on page 143, a full page group photo of Grand Duchess Marie Pavlovna, widow of Grand Duke Vladimir with her children and their families. The photo was taken in 1912. Marie's five granddaughters are featured prominently, all dressed in white, several clutching dolls. What makes this book special, however, is the care paid to each branch of the Imperial Family. Nicholas and Alexandra and OTMAA usually get star attention. In The Romanovs, we get to meet all of the family, the aunts, the uncles, first cousins, second cousins, thanks to Eurohistory's impressive photo archives. British biographer Coryne Hall and Arturo Beeche are the co-authors of The Romanovs. Coryne has written several books on Romanovs, including a biography of Empress Marie Feodorovna, and she knows her subjects well. Do I recommend this book? Yes, absolutely! This is a history of a once proud dynasty, brought down by revolution and hubris seen through the eyes of a camera lens. Don't rush through this book. Take your time. Relish and appreciate the portraits and the family snaps. You will not regret purchasing this book.